The balanced approach to hi-end valve sound? Cost: VL20: 1880 euros, VS70: 2000 euros. I usually focus on the mid-to-budget end of the market for my review items, but this time I've moved up a level or two to look at a pair of items from JE Audio, based in Hong Kong. This review is of their balanced pre, and power amplifiers, the VL20 and the VS70. Both the VL20 and VS70 make quite an impression well before you plug them in and play any music. When the delivery man handed me a very large carton, I assumed that it contained both pre and power amplifiers, but he returned to his van and brought another carton the same size as the first. And I'm not exaggerating when I say that it was quite an effort to carry both these cartons upstairs to unpack them. It's not so common these days when accountants rule the roost, and plastic is the most cost-effective way of housing something like hi-fi, to see an item of hi-fi described as being 'built like a battleship'. But both the VL and VS70 certainly fit into that category! No flimsy aluminum panels for them. Instead some of the panels are up to 9mm thick. Both items employ a clever design to help keep things cool, and keep the valves protected. They use what I call a 'chimney stack' design where the case is shaped like a square bagel, ie with an aperture in the centre. The valves then exit the case inside the aperture so that they cannot be knocked and broken. The heat from the valves can also rise up through the aperture, to be replaced by cooler air from under the case. To assist this convection effect, the cases sit on enormous feet that keep them some 30mm above the shelf. Sturdy metal grilles over the apertures mean that the valves are well protected, and can't be touched by inquisitive young fingers, or curious pets. An added advantage of this design is that it adds to the rigidity of the whole case because there are two 'walls' instead of one. I'm fairly sure that you could drive a car over each of these items, and not damage them. 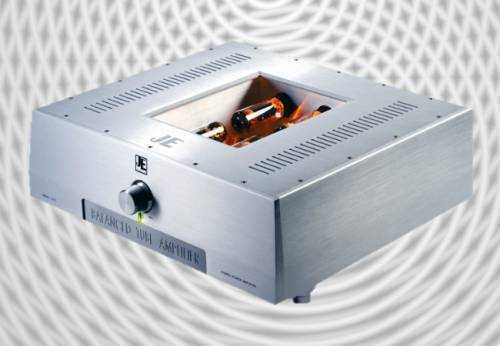 How many pieces of hi-fi can you say that about (particularly valve amplifiers)? The finish of the cases is very high. The slightly curved sides to the cases are a nice touch. I'm not quite so sure about the over-all appearance though. The large recess on the front with the words 'BALANCED TUBE AMPLIFIER' boldly engraved into it is a little 'industrial' for my taste. That said, it is difficult to build something as large (and robust), and keep it attractive in a domestic setting. The VL20 and VS70 are certainly built with practicality in mind, rather than aesthetics, although neither can be considered to look ugly. Owners will however, require a strong equipment rack, and with each item sitting more than 170mm (6.5 inches) tall, it would be as well to check that they will fit between shelves prior to purchase. I should add that they do fit nicely on a standard hi-fi shelf and it is only the depth between the shelves that you need be concerned about. The VL20 offers most of the facilities that should be included on a good quality pre amplifier. You can choose from four sets of balanced inputs or unbalanced (RCA) inputs. I would have like to have seen a remote controlled volume control, although the pot included is quiet in operation and has a very positive and smooth feel in use. What you get for the money is easier to see in the specification. Use of wideband balanced amplifying topology to improve low-level signal integrity. Use of wideband MOSFET transistors in high performance constant current source to improve common-mode rejection ratio (CMRR). No load resistors, no buffers and no followers. No semiconductor transistors, op-amps or transformers for signal amplification. Premium grade R-core power transformer reducing noise and electromagnetic interference. Premium grade precision DC regulated power supply. Use of audio grade signal capacitors. Soft-start circuit reduces inrush currents when switching on. It also ensures that in the first 30 seconds a reduced supply voltage is applied to vacuum tubes. This prolongs life of all rectifying diodes, power supply filtering capacitors and vacuum tubes. There's obviously a lot of thought gone into the circuit design of the VL20, and it's construction. Internal layout is about as immaculate as it can be. Everything not only works well, but provides an air of confidence. There are no nasty noises involved in turning the VL20 on or off because everything is taken care of with delay circuits quietly switching relays on and off at the right time. Fully balanced input (also has separate RCA input). Fully balanced output (no loudspeaker terminal is connected to a ground terminal). Patented Dual Balanced Feedback Topology (DBFT) improves signal linearity and audio fidelity. 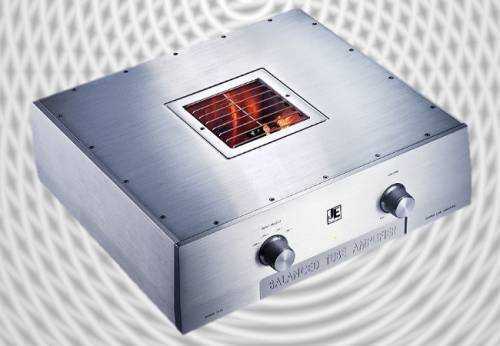 Stereo 2 x 35W output (2 x KT77 power tubes per channel) with premium power supply. C-core filtering choke and premium capacitors are used in power supply filtering circuit. Output transformer uses premium grade M6 silicon steel imported from the United States. The primary side is connected in the Ultra-linear configuration and the secondary side in a proprietary full balanced configuration. Power transformer uses premium grade grain oriented R-Core imported from Japan. Lownoise and high efficiency ensures minimum temperature rise from the power transformer. Premium grade copper foil paper in oil type signal capacitors for signal coupling. Fixed biasing is used for power tubes. Biasing current for each tube can be adjusted individually. Soft power-up circuit reduces the inrush current when switching on. It also ensures that in the first 60 seconds a reduced supply voltage is applied to small signal vacuum tubes but zero supply voltage to power vacuum tubes. This prolongs life of all rectifying diodes, power supply filtering capacitors and vacuum tubes. The VS70 stereo power amplifier closely follows the design from the mono block power amplifier VM60. Except that VS70 uses lower power tubes and output transformer, the design follows the identical patented Dual Balanced Feedback Topology (DBFT). Balanced operation will effectively cancel external electromagnetic noise picked up by audio cables. Together with the improved linearity given by the DBFT, the sonic result is a transparent sound quality with three-dimensional images in a natural acoustic landscape. Single-ended input signal via the RCA socket can also be benefited by the balanced operation. The full balanced operation is achieved by employing the DBFT as shown in the diagram below. The positive INPUT and negative INPUT signals are first fed to the input stage that is formed by 2 x 12AX7/ECC83. Each 12AX7 contains two small signal triodes in the same glass casing. Therefore, the first stage is formed by four small signal triodes. They are configured in such a way that the first stage will amplify the input signals as well as two pairs of feedback signals in a well orderly manner. The second stage is formed by 1 x 6DJ8/ ECC88. It is to further amplify the signals from the first stage and provides low output impedance to drive the output stage. The output stage contains 2 x EL34 and a balanced output transformer. The feedback signals are taken in pairs so that accurate balancing can be maintained. The first feedback pair is taken from the outputs of the second stage. Small amount of feedback is used so that the bandwidth, distortion and output impedance of the first two stages combined are improved. This small amount of feedback also sets the signal gain of the combined first two stages. A second feedback pair is taken from the transformer outputs. Again, small amount of feedback is used to further improve the bandwidth, distortion and output impedance of the overall amplifier. On the other hand, JE AUDIO has spent extensive hours to select the best available vacuum tubes in the markets based upon their sonic merits and operation stability. All tubes are burned in for at least 50 hours before they are tested for electrical characteristics so that matched tubes can be obtained. I'm no valve amplifier designer, or even expert, but this looks a bit different to the simpler valve designs that I have looked at in the past. However, 'the proof of the pudding is in the eating' as we say in England, so how do the VL20 and VS70 sound? To audition them using their balanced connections, I used a Harmony DA9 DAC (with balanced outputs) fed from a modified Logitech Squeezebox, and my open baffle speakers using Goodmans 201 drivers. As usual, I left the system running for quite a while before doing any serious auditioning. I don't know how much that added to my electricity bill but there was a nice warm atmosphere around the hi-fi rack! That said, neither amp really runs very hot, and the 'chimney stack' works well. The first impressions of the sound were of how effortless it sounded. The music simply 'floated' out of the speakers with no force behind it at all. The sound stage was simply gigantic. In fact on one or two tracks that I played, it was almost too big inasmuch as something like a saxophone ( Scott Hamilton 'Nocturnes & Serenades') appeared to be a metre or more in size! But the upside was that orchestral works had real scale and impact. It was the best that I had ever heard the 1812 Symphony on any hi-fi system! At first, the effortlessness of the JE Audio amps can make them sound a little soft, but after time I realised that was really an absence of any harshness rather than a failing to portray the 'edges' of notes. The sound was beautifully transparent, and the smallest details were quite recognizable. With such large imaging, there is plenty of 'air' and space between everything, and that helped me hear the smallest details. Timing was spot on, bass impact was good, and top end was crystal clear without ever coming near to being tiring. Everything that I played through this combination was enjoyable, and particularly musical, although I would say that it slightly favours, jazz, classical, acoustic etc (ie more 'laid-back' music) rather than rock. It's also a sound that allows the listener to sit back, relax, enjoy the music, and not think too much about where it is coming from. We often talk about speakers 'disappearing' but during this review, if I hadn't have had the hi-fi rack, and the two giant silver cases right in front of me, I would have said that the whole system disappeared, as well as the speakers. Imaging wasn't quite as sharp as the best that I have heard, and I wondered if that could have been improved with my usual method of mounting the equipment on granite platforms with the DD Tripods. But in this case, there simply wasn't enough space between the shelves to do so! Obviously if I was keeping this equipment, I would go to the trouble of setting it up optimally and I believe that would reap some improvement with the imaging. I also set up the VS70 power amp with the excellent KingRex Preference pre amplifier that I reviewed earlier this year. The combination sounded very good but didn't achieve that totally 'effortless' presentation that the VS70 has when used with the VL20! I then tried the VL20 feeding a Virtue Audio TWO, class-T amplifier, a real mismatch in terms of cost, but one that produced a very good sound. But it would appear to be the synergy between the VL20 and VS70 that really brings out the best of both these pieces of equipment. I very much liked the sound of the VL20 and VS70. I think that they will be at their best with more efficient speakers, and I suspect that they may be an absolute dream if you favour horns. For anybody wanting valve amplification, I suggest that the quality of these items, their innovative circuits, and their beguiling sound quality, should make them strong contenders in their price range. Considering the build quality, and the sound, I would say that they are something of a bargain in their price range. This combination produced a sound that I hadn't heard before. The effortless way that the sound simply flowed from the system made me forget about 'hi-fi' and concentrate much more on the music. That's surely what it should be about and I therefore give the JE Audio VL20 and VS70 combination a strong recommendation. I would also suggest that this combination would be best in a larger room --with larger speakers - and on a larger rack!